Jenn and Andrew met at a climbing gym and they both love the outdoors. 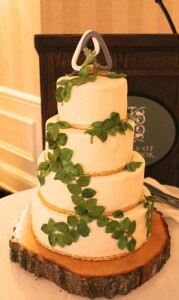 They wanted to make sure to incorporate some climbing touches to the wedding, along with keeping it eco-friendly. 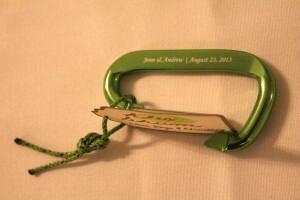 To start off, their place card holders came along with personalized carabiners. I thought this was a very cute touch and I always appreciated a favour that is actually useful (Just a note that I also like when they’re tasty). Their cake (made by a friend) also featured two intertwined carabiners, which was sweet. 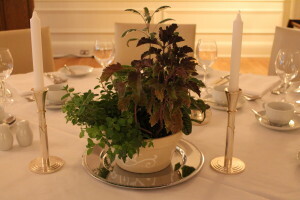 I loved the alive plant centerpieces that guests took home and will likely have for years. My favourite part of the day (other than the crazy dance party), was the bouquet toss. 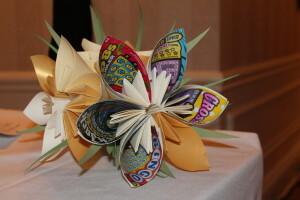 Not being one to discriminate (or to make all of the single ladies get on the dance floor), Jenn made a special tossing bouquet with scratch cards. She tossed her bouquet to the soundtrack of “Money, that’s what I want”, to all of her guests (male/female/single/taken) and instead of a man, the catcher received the potential to win millions ;). 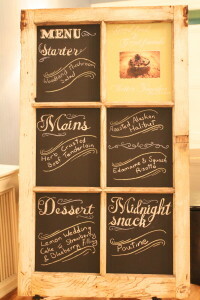 It was a great way to incorporate the bouquet toss tradition. I’ve been to the Estates of Sunnybrook a few times now and every visit have been wonderful. 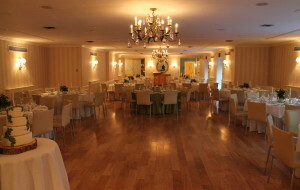 We were in the Courtyard Ballroom which was a nice room and it has an outdoor patio available (although it happened to be a bit cool the night we were there). 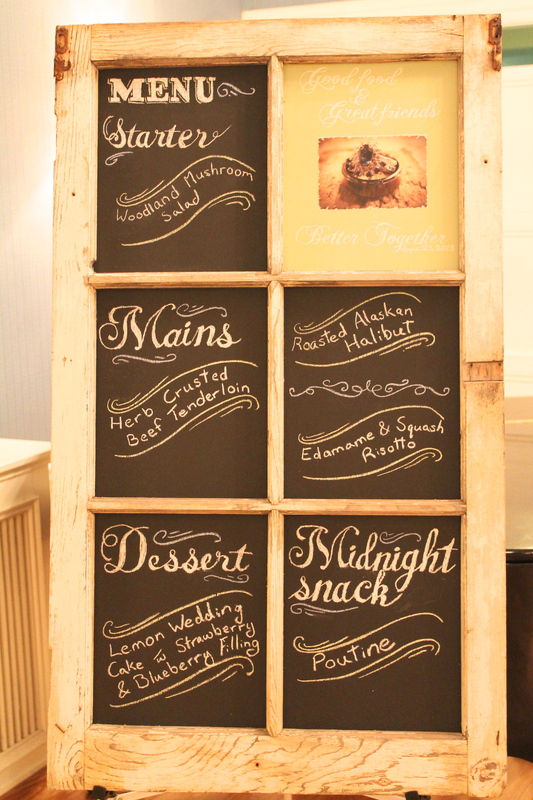 The food was delicious and the staff were very attentive to me and the guests.